r works well enough to serve as an automatic bathroom light. I can see many uses if you wanted more light in a dark hotel room, you could pack this and use it effectively. It’s a plug-in lamp, the left side of the bar slips out and reveals a USB port to charge it. It’s two and a half feet long. Then, no power cord, no wires, easy to install or bring with you. The motion sensor turns it on when you walk by so it’s perfect for a bathroom or entryway. Comes with a double-sided adhesive strip to tack the light up where you want it. For camping, or just for that shed where there is no electricity, this bright little light comes in awfully handy. It’s three bright LED lights with a little switch on the front, not like the motion detector one above, but smaller. It comes with sticky pads so you can affix it to the inside of a closet or a shed, or bring it on a camping trip to light up your tent. I really like these, and they use AAA batteries, so it’s a quick fix if they go dull. Fix n Zip. A replacement zipper slider that allows for repairing a sleeping bag, jacket or suitcase zipper without tools or sewing. This fits a range of different zipper sizes and comes with a little measuring indicator on the package. This is a pretty good idea if you’ve read about how bad all of this sitting around at desks is for our health. 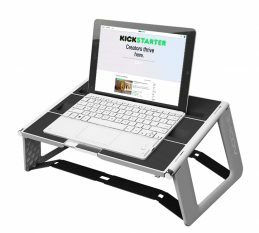 An inexpensive solution is this fold up plastic stand up desk, that fits on a regular desk, with a little groove to fit your keyboard in. Imoov also includes a fabric briefcase and a wireless keyboard in case you want to use your iPad. It has grooves that fit an ipad and their wireless keyboard. I had trouble syncing the keyboard like I do with many Bluetooth devices, I must admit. Eagle Creek’s got a new line of bags and backpacks that fold into themselves. This creates a great bag to throw in your suitcase, for whatever extra stuff you pick up on your travels, or if you just want to have a nice little day pack for another person. This packable day pack is a full backpack, with padded straps, an 11 x 17.75 x 4.75-inch size and it weighs a mere 5 ounces. Available in royal blue, black or tan, this one is practical for travelers. NapAnywhere is “The neck pillow reimagined.” Instead of functioning like an everyday neck pillow, the NapAnywhere keeps your head upright and supports the weight of your head. You don’t have to push down on the NapAnywhere with your head; just a slight neck tilt will do the trick. The NapAnywhere’s unique design allows for total neck relaxation with ease.